For over a decade now, the Thrombolysis in Myocardial Infarction (TIMI) flow grade classification scheme has been successfully used to assess coronary blood flow in acute coronary syndromes (1). Although this scheme has been a valuable tool for comparing the efficacy of reperfusion strategies and identifying patients at higher risk of adverse outcomes in acute coronary syndromes, it has limitations (2,3). To overcome them, the TIMI Angiographic Core Laboratory developed a new index of coronary blood flow called the TIMI Frame Count (2). In contrast to the TIMI flow grades, which are subjective categoric variables, the TIMI frame count is an objective continuous variable (2). 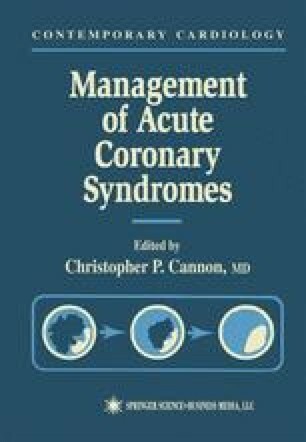 The goal of this chapter is to review these two methods and to discuss the insights into the pathophysiology of acute coronary syndromes provided by these indexes of coronary blood flow.